October 21st – 28th 2019, Spain – 2 Spaces Left! This week is an opportunity for a group of 8 experienced retreat chefs, venue owners and course leaders to come together and take retreat. As people who spend much of our time focused on nourishing others it is essential that we take time for ourselves. 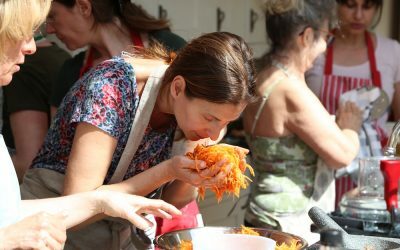 This unique training is designed for anyone who is or wants to be a retreat chef. Venue owners, course facilitators and teachers will also find this training highly beneficial. Come and learn from the experts in retreat catering and discover how you can create outstanding food for your events. Contact us directly to receive prior notice of 2020 dates. Our specialist courses and retreats explore Optimum Nutrition. We look at what this means for the times are living in now and how to integrate these principles into daily life. You might feel drawn to explore the systems of Ayurveda and Chinese Medicine or be interested in learning more about raw/living foods, plant based cuisine, intolerances and allergies or healing and medicinal foods. Retreats are residential and are normally for one week. They include daily qi gong, yoga, meditation and mindfulness practices to support and deepen the retreat experience. To find out more about each retreat or to book a place, click on the links provided. This Bloom retreat was just what I needed to reconnect with myself and my health. I learned so much about nutrition and the cookery courses have changed my approach to my beloved cooking. Kirsten & Hayley worked so hard to facilitate this fabulous retreat. If you can go to one, DO! 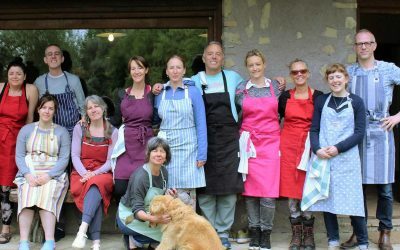 Experiencing how diet profoundly affects the state of mind and body on a yoga and holistic cookery retreat with Hayley has been truly inspiring. She cooks nourishing, tasty, wholesome food that not only supported my yoga practice but kept me balanced and satisfied during each day. Hayley shows how aligning food and yoga brings physical and energetic space that enables you to move, think and work with ease, grace and lightness. Her explorative approach to yoga has also been a wonderful discovery bringing new energy and inspiration to more than 30 years of yoga practice. I cannot begin to explain how amazing and life changing this retreat has been, really an honour and an awakening! The energy was consistently pure, sattvic and nurturing. This training taught me so much, in particular regarding my own self-care, that I now feel confident to go home, sort out my cupboards and get cooking again. I can’t wait to start to share this at my own retreats soon. Thank you!